As much as we may love basketball, there is simply more to life. Practicing and playing too much can lead to overuse injuries and burnout. So, even if it feels like you never want to take a break, you should, at least to make sure you stay fit and rested enough to continue playing after taking some time off. Another benefit of a little time away from the game is that you can develop other athletic skills, including different forms of leadership and teamwork that will contribute to your basketball success when you return the court. Also, taking time away from sports altogether leaves time for activities that are ultimately more important, such as family, friends, academics, and experiencing other parts of the world and other forms of fun that make you a more well-rounded person. The retreat dribble is also known as an escape dribble as it helps the offensive player retreat or escape from defensive players in front of them. The retreat dribble relieves the offensive player from defensive pressure in order to dribble by, pass or shot. To make an effective retreat dribble, a player must turn their body perpendicular to the defensive player so that the side of their front foot and shoulder are facing the defender and the ball is on the opposite side away from the defender. The player will push back off their front foot quickly to move away and create space. Once the player has created space, they will square back up so that they are again parallel or face to face with the defender. The players will dribble with their right hand to the free throw line extended in front of them and take two retreat dribbles back while keeping their shoulder between the imaginary defender and the ball and pushing back. 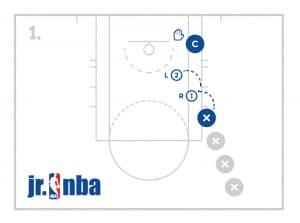 After 2 dribbles back, the player will square up and dribble forward and do the same process at half court, the opposite foul line extended and the opposite baseline. Do the same thing with the other hand. An outlet pass is a pass that happens following a rebound. Typically a player gets a rebound, pivots and turns to make an outlet pass as their team transitions to offense. An outlet pass can often be an overhead pass. It is important for an outlet pass to be quick, strong, and potentially lead the offensive team to a quick advantage. When receiving the outlet pass, it is important that the player (typically the point guard) first gets close to the sideline where the rebounder is able to see them. 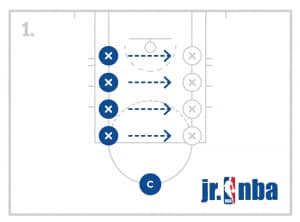 Next, the players back should be towards the sideline so that their chest is open to the entire court which will allow them to see everything in front of them. The player must then call for the ball with their hands and mouth. Also, it is good for the player to catch the ball with some momentum going toward their basket if there are no defenders to discourage the pass. After the catch it is important for the player to look to pass ahead if possible. Have the players get in 1 line at the top of the key with the first several players having a ball. 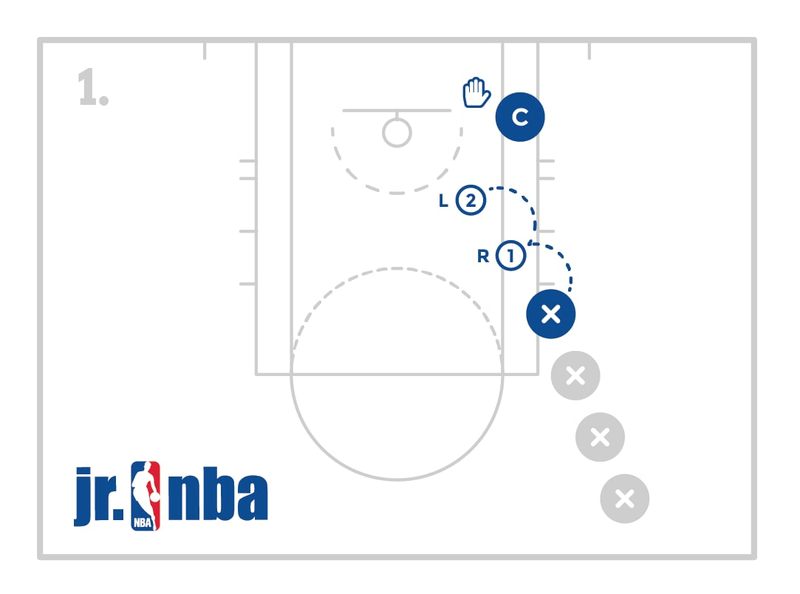 The first player will pass their ball to the coach who is standing in the middle of the paint. The coach will toss the ball to themself to their right or left side. 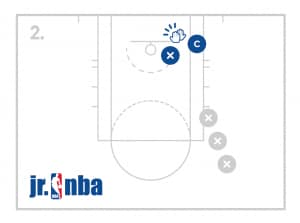 The player will react to which side the ball was tossed on and get their back to the baseline on that side and prepare to receive the outlet pass. As coach makes the outlet pass, the players will catch the ball on the move and dribble to the other end of the court for a lay-up and then go back to the end of the line. Continue this for the allotted amount of time. Have the players get in 2 lines, 1 at the free throw line and 1 on the elbow. Each player in the line at the free throw line will have a ball. The opposite line will not have a ball. The first person in the line with a ball will step up inside the three point and toss the ball off the backboard and go jump and grab it like a rebound. On the toss, the first player in the other line will get to the sideline to properly receive the outlet pass. The rebounder will pass to the outlet player. 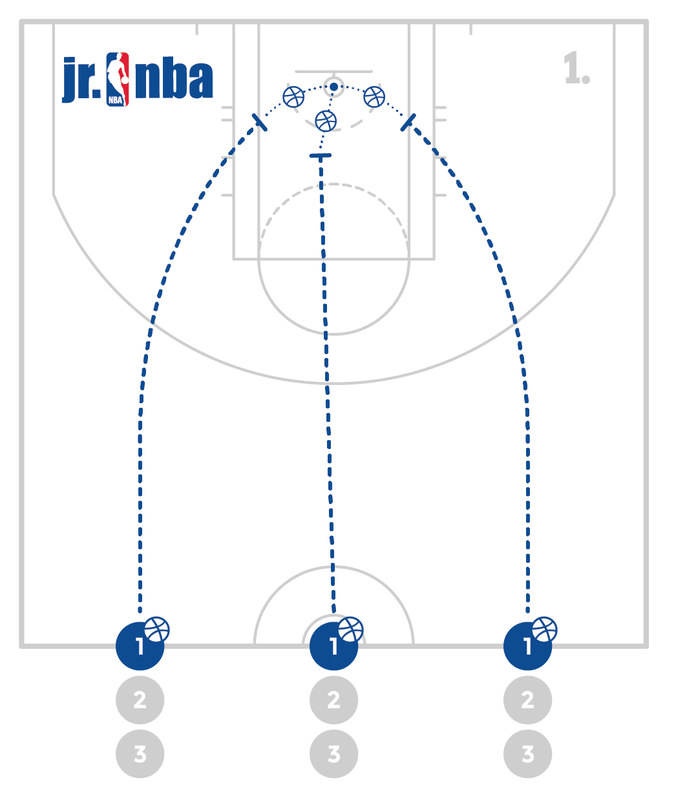 The player who received the outlet pass will dribble up the floor going to the middle of the floor. The player who grabbed the rebound will run wide outside the player with the ball to the other end of the court. The player with the ball will make a good jump stop and make a bounce pass to the other player for a lay-up. After the lay-up, the players will get in line from the other basket, change positions, and do the same thing coming back. Work on executing a good rebound, being strong with the ball and making good outlet passes. Also work on receiving the outlet pass and dribbling the floor for a good jump stop bounce pass and lay-up. A lay-up is a shot taken close to the basket, generally off the backboard. There are a variety of ways to shoot lay-ups and they should be worked on every day by players of all ages and skill level. A drop step lay-up, is a lay-up that occurs when a player catches the ball close to the basket but with their back facing the basket. On the catch, the player drops their bottom foot to turn for a lay-up. The drop step lay-up can happen with or without a dribble. Teach the players how to drop their foot as the ball is coming and keep the ball hidden away from the defender without taking a dribble for the lay-up. Emphasize a big powerful push off the top foot that allows their bottom foot to drop below the defender’s bottom foot. This will allow the player to take and clear the space needed for a good balanced lay-up. Have the players partner up and face each other at half court with each of their backs facing the opposite baseline. One player will have a ball and the other will get into a good post up stance. The player will roll the ball to their partner. The partner will sit in a good stance and grab the ball then drop step by dropping their left foot at the same time as they turn and dribble. The player will pick up the ball after the one dribble and pretend they will jump and shoot as they are now facing the basket. The player will land, turn back around and roll the ball to their partner. That player will do the same action by grabbing the ball, taking a drop step with their left foot while they turn and dribble and simulate shooting at the basket they are now facing. 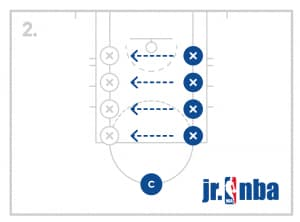 This player will complete 5 drop step lay-ups alternating sides so that on their last lay-up, the 3rd player will start from the opposite side. The players will continue this activity and then switch their drop step foot. All players should be in one line with no ball as the coach demonstrates how to take one step with their right foot, a second step and jump off their left foot and extend their right hand to simulate a right handed lay-up. The coach will stand with his/her hand in the air as each player comes by and does this 1, 2 step while saying “1, 2” and gives the coach a high five with their right hand. The line should move quick and if there is another coach, utilize 2 or more lines. Players should repeat this going left with the opposite footwork (jumping off the right) and opposite hand (left) giving the high five. A euro step lay-up is a lay-up in which the player takes the last two steps to step laterally side to side instead of the traditional straight forward steps. Euro step lay-ups can be a deceptive way to finish around the basket as it allows the offensive player to step around defenders as well as slow down their steps if needed. Have the players start on the baseline without a ball. 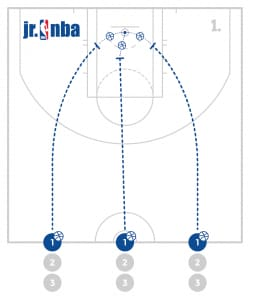 On the players command, the players will step out, then in and jump for proper euro step form. The players will do this again and repeat for the allotted amount of time. Divide the players into balanced teams and have them start at half court. There should be 2 balls in the front of each line. 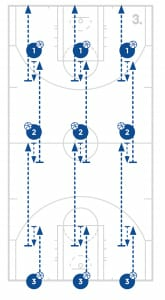 The players will dribble toward the basket and take a lay-up, get their rebound and dribble/pass it back to their line. The next player can go as soon as they are ready. The team must make a designated number of lay-ups. Once the team makes the designated number of lay-ups, they will continue with the same process but now shoot jump shots. The first team to make all of their jump shots wins the game. 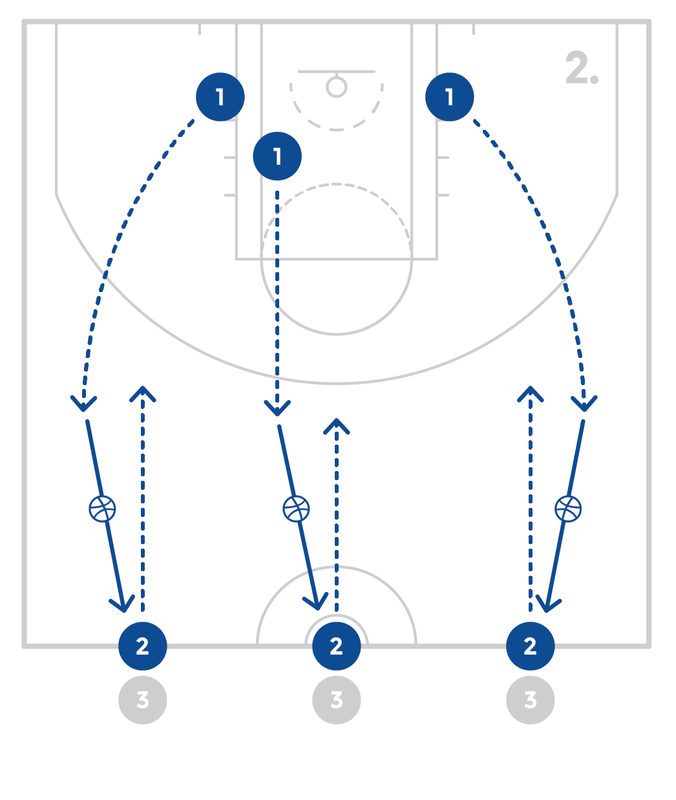 Use this fun competitive game to work on lay-ups and shooting. Encourage teams on the left side of the basket to use their left hand for lay-ups but count the makes regardless.